Kat and Karl : a rainbow of awesome? In the meantime, I've been mulling over this idea in my head for awhile now and thought I'd post an image of a sketch I created this evening. I've been wanting to do some organizing of the mass quantity of books and toys in Nate's room. (Honestly, he doesn't have that much but there is no receptacle or bin to place said playthings.) I started looking online for toy boxes and was discouraged. So, I drew up my own plans. 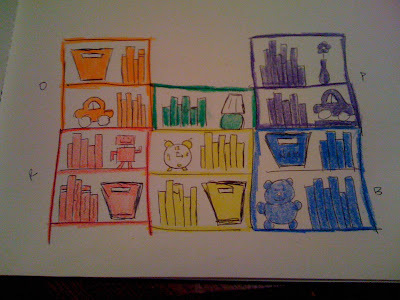 My rough sketch - please excuse - shows bookcases that would be painted in various colors with that color family of books and toys placed upon the shelves. I can't decide if I should take the time to do it for Nate's room or wait for the next nursery (whenever that may be) plans - pretty sure we'd have to bolt them to the wall either way, yes? I feel like maybe the idea is cuter in my head than it is on this sketch! I want them in my room, please. 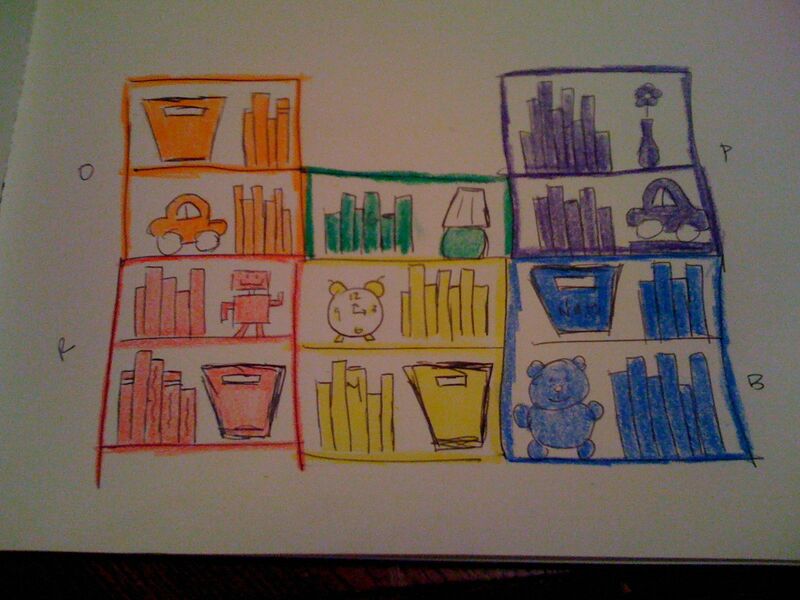 Your drawing and organizing by color pleases the OCD in me beyond comprehension. i think it would be adorable. at school, the k-1st and younger grades have these "atelier" or art studio areas with white open shelving (no backs on the shelves) and each shelf has all materials of one color on it. there will be a jar with orange pencils, a bowl of orange yarn, etc., on the orange shelf. it's super awesome looking. very cute. would the ikea expedit work? of course, I don't know how one would go about painting such a thing. Do you know it? Lots of easy looking plans for stuff like this. I say easy looking because I myself have never attempted any of them, but it's worth a look. Good luck! I love this idea!! And it would be a good way for Nate to learn where things go, just match up the colors! I'm no help on how to go about making these. We built some bookcases ourselves and they turned out...oookay...but I wish we would've just paid someone do do them for us, we didn't really save much money and they would have looked tremendously better. Plus, it's been over a year and they still aren't completely finished. Woops. I need a similar design for my 14 year olds room. She has books, stuffed animals, jewelry along with a ton of other stuff that needs a place. I think I saw something like it in Target once.